How do I add a new Google Apps account? Step 1) Login to your Google Apps Administrative Console. 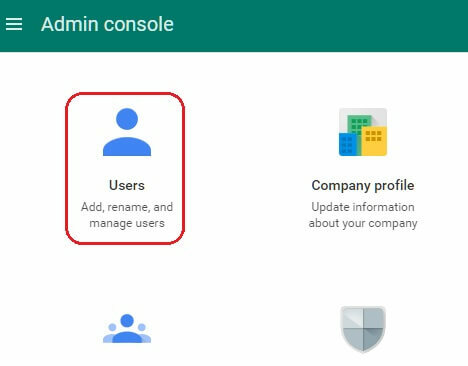 Note: You must be an administrator for your organization to login to the Google Apps Administrative Console. Step 2) Once logged in, click on the 'Users' icon. Step 3) Click on the circle with a + sign in the bottom-right and click on 'Add user'. Step 4) Fill out the form as desired for the new user and then click on 'Create'. Note: If you get a message saying 'You have reached the ## user limit for this organization', you will need to contact Virtual Vision to allocate more users for your organization.